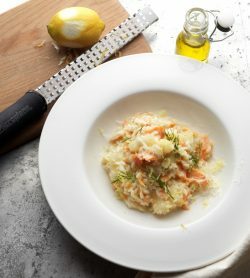 Adding vodka to a risotto may sound a little strange for some, but it really adds a wonderful flavour to the rice and compliments the sweet fennel and smoked salmon beautifully. Place the stock in a pan, heat until boiling, then reduce the heat and keep it at a low simmer. Peel the fennel, reserving any fronds as a garnish if wished. Cut it in half and remove the woody centre cores, then cut the fennel into 1 cm cubes. Add any trimmings to the stock for extra flavour. In a heavy based pan, heat the olive oil and 25g of the butter, add the onion and fennel, cook over a low-medium heat for 4-5 minutes to soften the vegetables. Add the rice, stir together with the vegetables and cook for about 2 minutes, stirring frequently, until the rice is translucent and well coated. Add the vodka, cook for 2 minutes , or until it has been completely absorbed. Continue adding the stock, a ladle at a time, letting each addition be absorbed by the rice before adding the next. After 18-20 minutes check for the required ‘’al dente’’ texture -the rice should be tender, but with a firm bite in the centre and a creamy moist consistency. Remove the pan from the heat, add the parmesan, remaining butter, smoked salmon and juice and zest of the lemon, stir in well. Cover the risotto with a lid , then let it stand for one minute before serving, garnish with any reserved fennel fronds and serve.